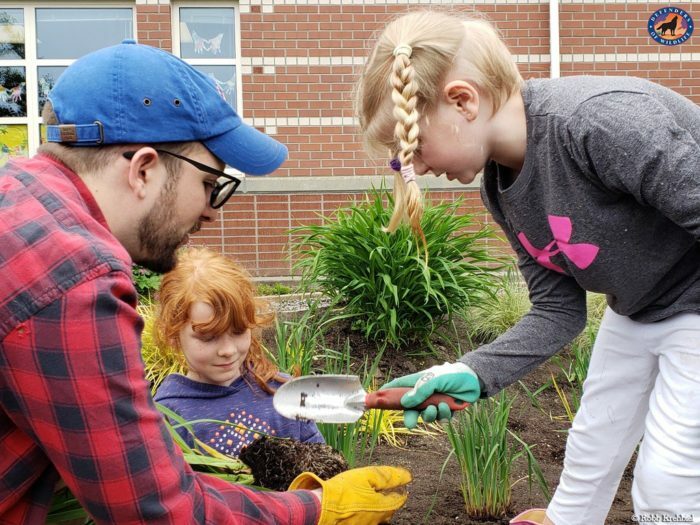 Earlier this year, Defenders and Washington Environmental Council spoke with a group of first graders at Sherman Elementary School about why Orcas Love Raingardens. Last week, we met with these students again – this time, so we could get our hands dirty: after spending the school year learning about raingardens and researching the plants they wanted to use, these first graders were ready to start gardening! One of the things these students learned about raingardens is the role they play in protecting highly endangered Southern Resident orcas. Raingardens are bowl-shaped gardens that capture and slowly filter polluted, stormwater runoff. Stormwater runoff is the biggest source of pollution in the Salish Sea, and it impacts wildlife. Once pollution enters the ecosystem, it builds up at every step of the ecosystem, concentrating in bodies of top predators, like orcas. Southern Resident orcas eat some of the most polluted salmon on the west coast, and this diet makes them some of the most polluted marine mammals in the world. Many of the chemicals found in their bodies have been linked to health problems, a reduced reproduction rate, and an increased infant mortality rate. But by installing raingardens, people throughout Washington can reduce the amount of pollution entering the environment. This not only keeps harmful toxics out of orcas, it also can help recovery the salmon populations that these whales rely on. That was exciting news to the first graders at Sherman. The raingarden at their school that they spent so much time researching and working on was suddenly part of something bigger. Their raingarden does more than clean dirty water. It protects orcas! Unfortunately, this raingarden had fallen into disrepair. Students were walking through the raingarden and many of the plants had died. 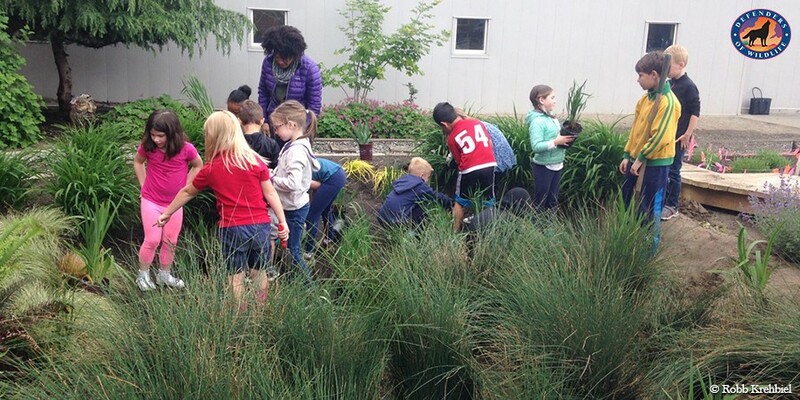 Undeterred, the students were eager to spend the whole school year figuring out how to make their raingarden better. With a little help, they were able to purchase some new plants and install a boardwalk through the raingarden, giving them a place to walk without stepping on any plants. For our afternoon of gardening, we started off by learning proper gardening techniques from the first grade teacher, and then we were off to work. Students got into small groups and helped each other dig holes for their new plants. It was fun (and muddy!) work. The whole time, we were blown away by how much these students knew about raingardens, plants, pollution, and orcas. It offered us hope that these kids will one day be leading communities and insisting that our cities and communities be built in a way that reduces our impact on wildlife. This was our first raingarden support project at Orcas Love Raingardens, and there are more to come. Projects like these teach students the importance of looking beyond our own communities to see how our actions impact the lives of our wild neighbors. Raingardens, like the one we visited last week, can also be great places for students to learn, explore, and play. In an increasingly urban world, it’s important for students to have access to green, natural spaces. 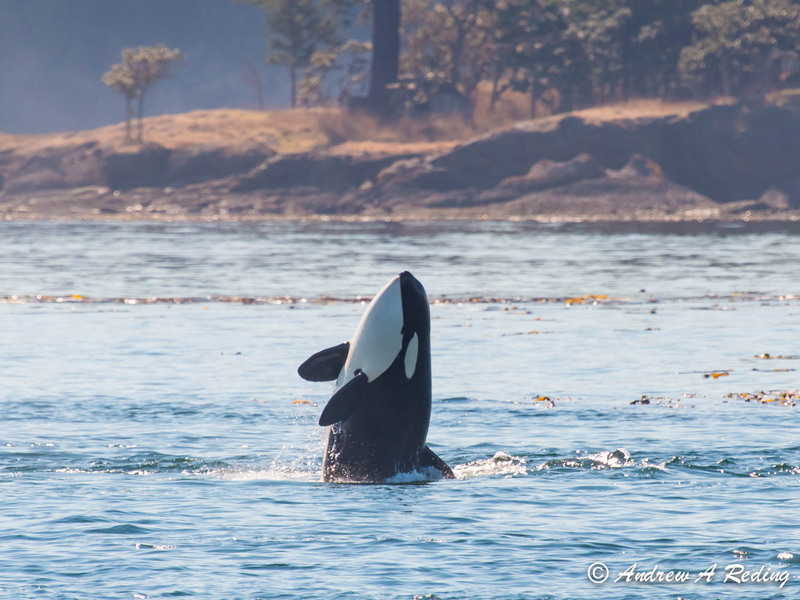 Photo taken by Andrew A Reding from Island Explorer 3, operated by Island Adventures Whale Watching, Anacortes, WA. It is our hope at OLR that as we continue to work with students and communities throughout Washington, people will not only recognize the role raingardens play in protecting orcas and salmon, but they will also see their world a little differently. The actions that we take in our day-to-day lives have impacts beyond our block. What we do has consequences for wildlife and their habitat. Programs like Orcas Love Raingardens challenge us to think broader, look farther, and to see ourselves and members of a larger community that includes plants and animals. When we start to see ourselves as part of the Salish Sea ecosystem, we have a better chance at coexisting with orcas, salmon, and the countless other species who share this home.